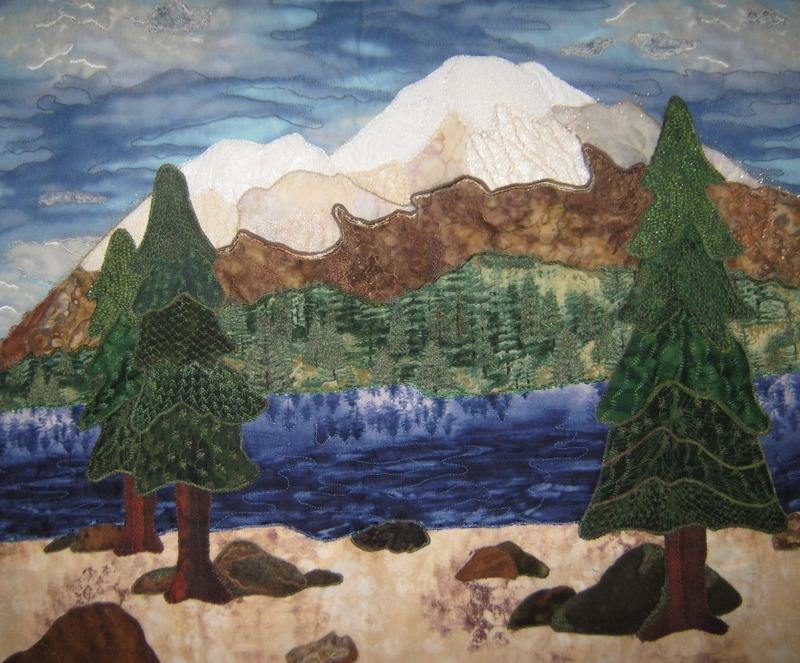 Every two years my local quilt group presents the work of their members. 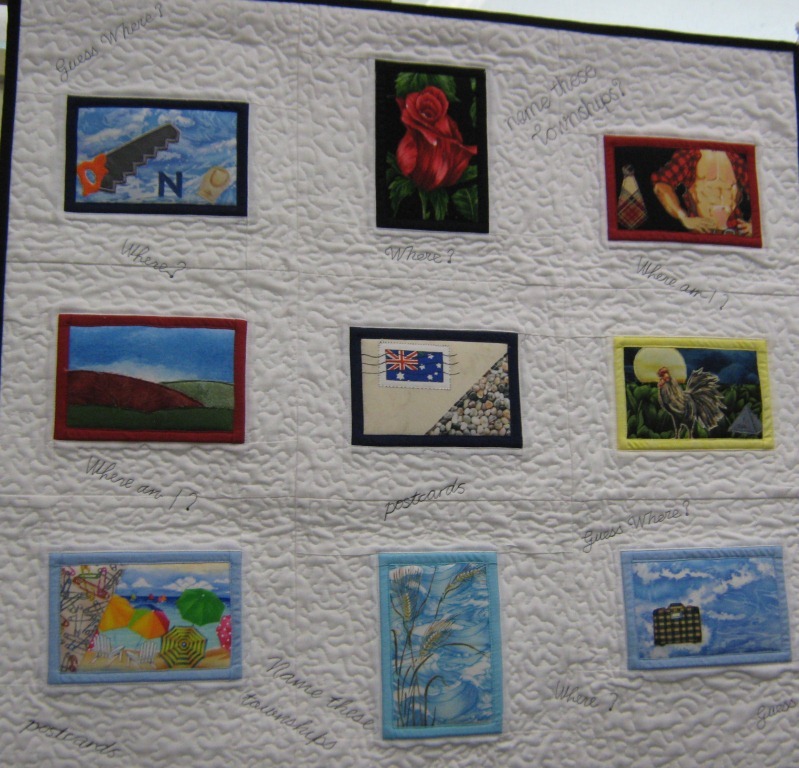 I have been a member for 15 years and I went to my first Waverley Quilt Show just a few months after I moved to the area. 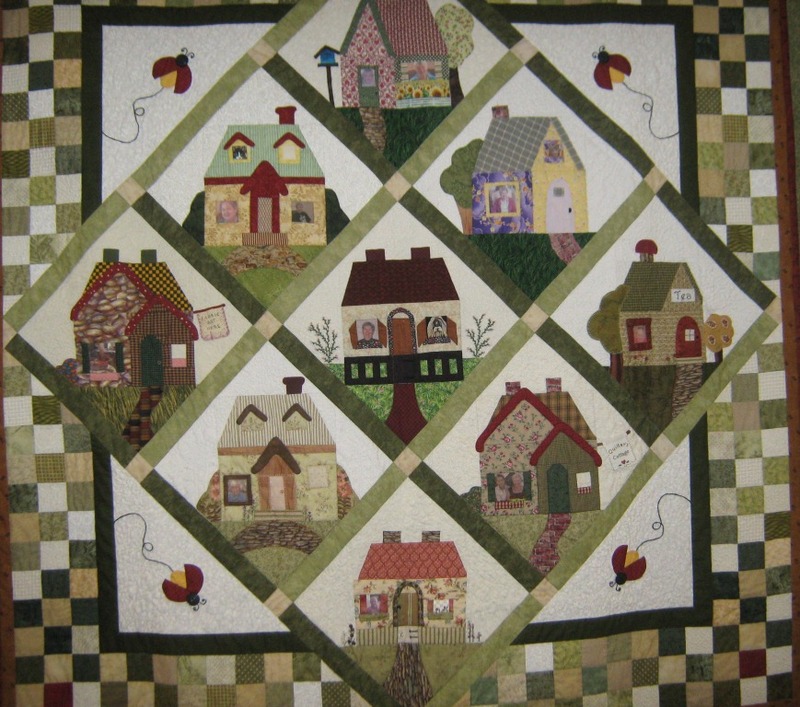 The quilts on display were all beautiful and represented every genre of patchwork from traditional to modern; hand pieced and quilted to machine pieced and machine quilted. 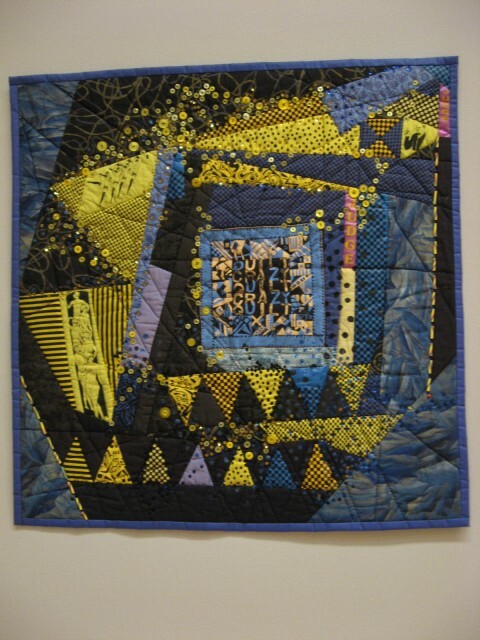 This year I entered my “Big O” Birthday Quilt. 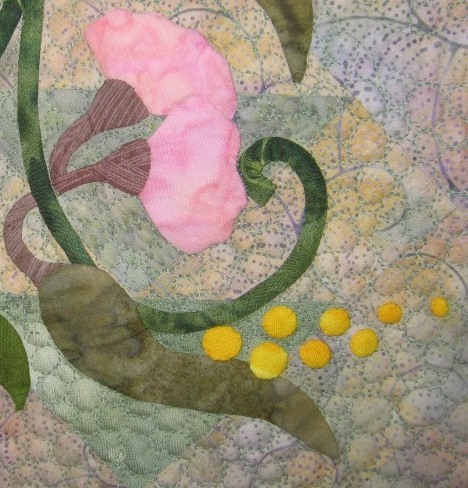 My friendship group, World Wide Wanderers, secretly worked on this quilt for a year. 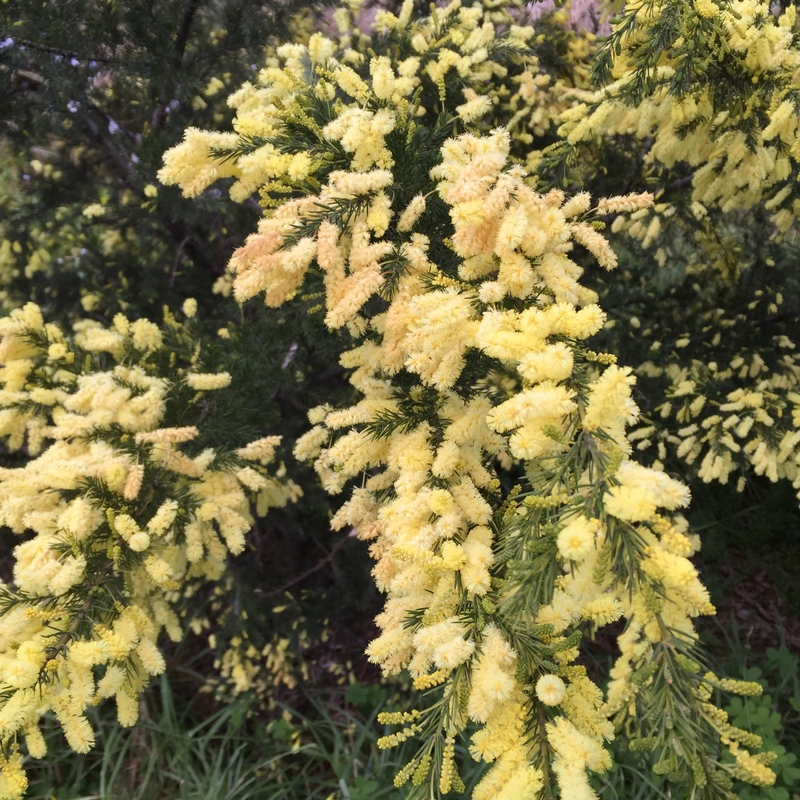 They even covertly contacted my husband to find out places of personal significance to me and then represented these places with its floral emblem. 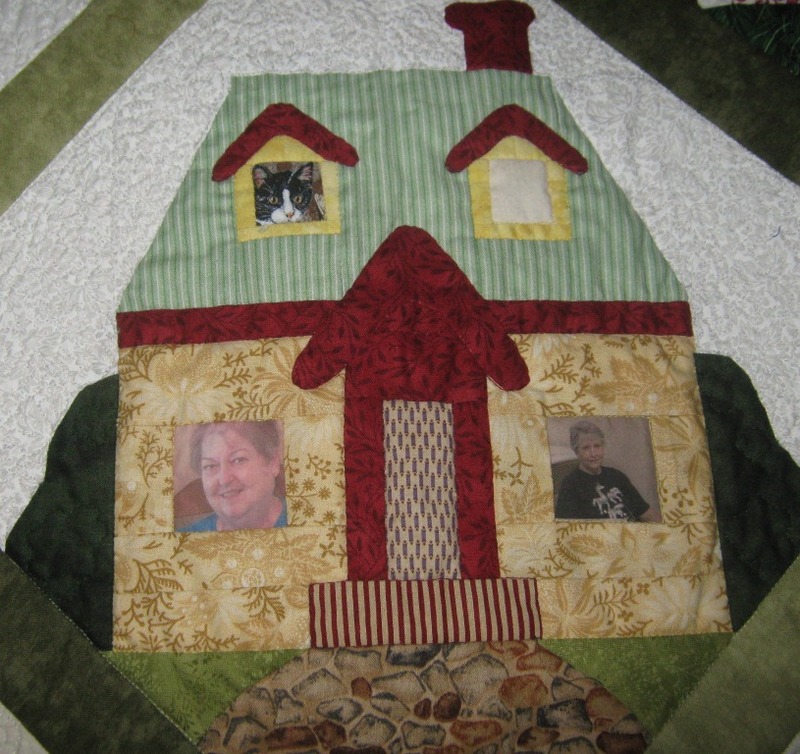 I was so pleased to show off this quilt to the community. It represents so much more than a special birthday. 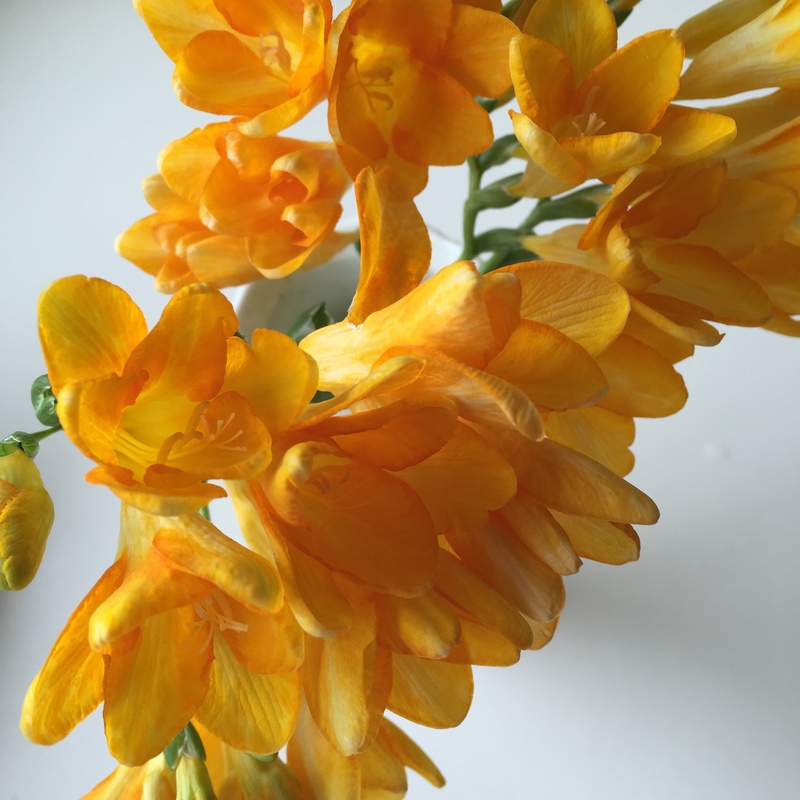 It is a treasure from my dearest friends. 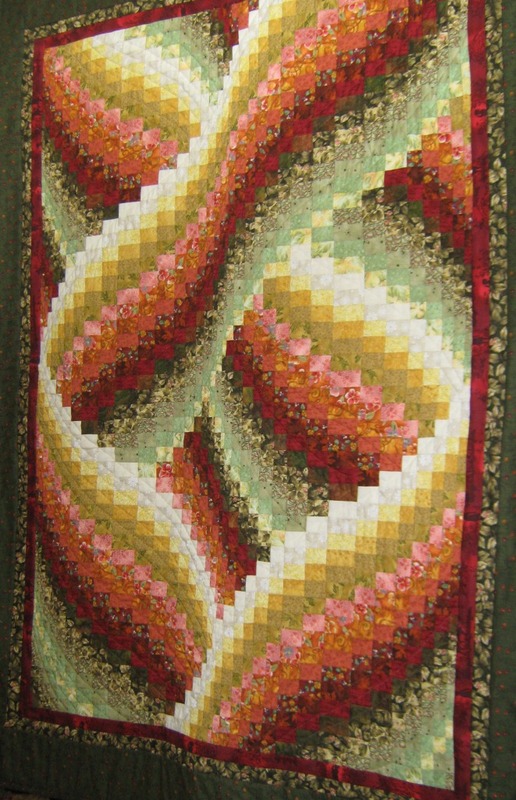 If you would like to see more quilts from our show, including the Viewer’s Choice Award winning quilt, visit Rose Lewis Quilting. 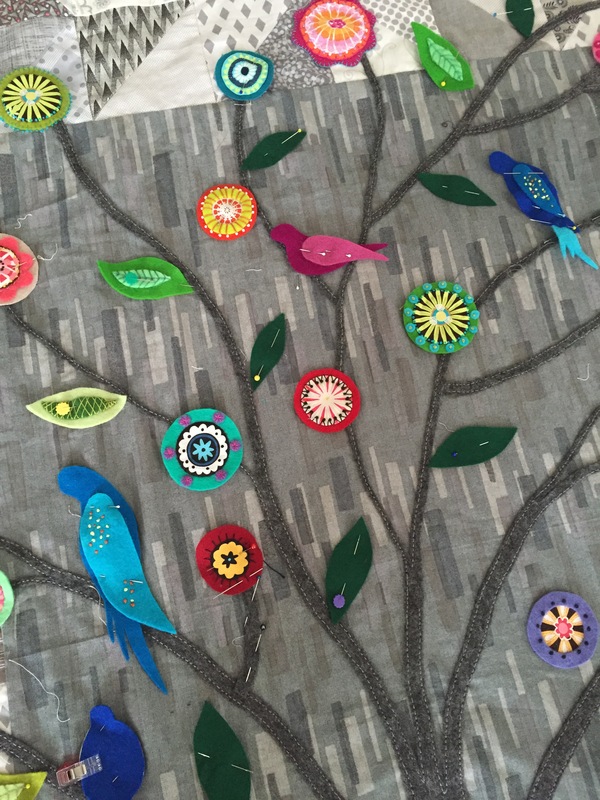 I know that some people do, but I don’t usually make Easter decorations however the pretty egg ornaments designed by Gudrun Erla caught my eye this week. 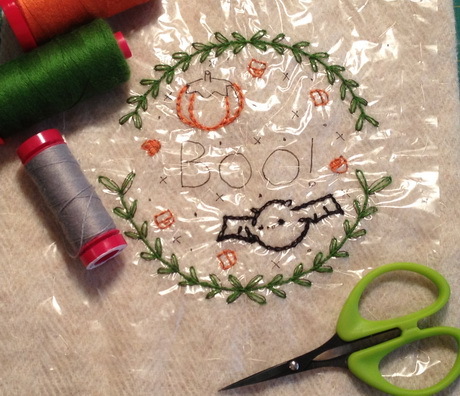 I could see that, with a minor modification, I could make great fat free gifts for my stitching friends. 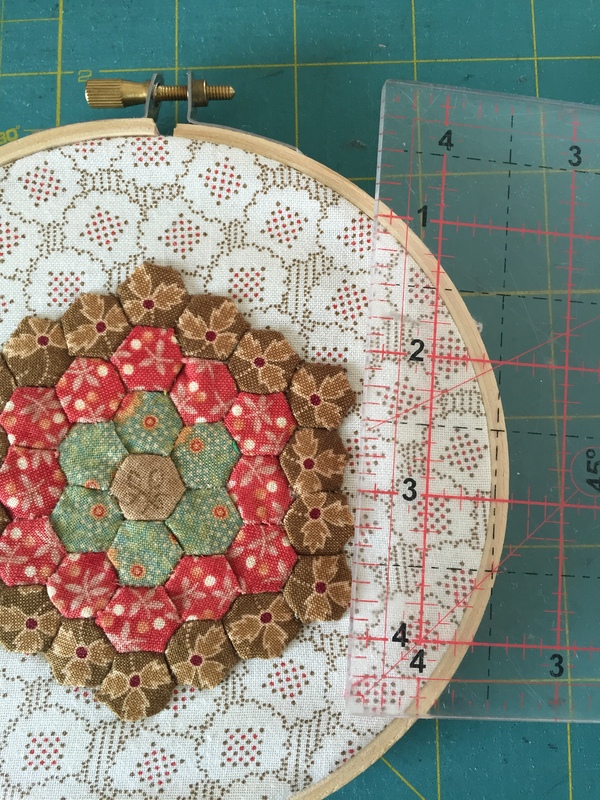 When I made my eggs I modified the instructions to leave a “pocket” into which I can pop a spool of thread ….. Aurifil of course, as a tasty treat for patchwork, quilting and embroidery enthusiasts. The original instruction has the top edge of the pocket folded back, and stitched down to the egg, to make pretty trim. Rather than do this on my “eggs”, I left the top edge open to form the pocket. These really were fast & fabulous to make, choosing the fabrics took more time than making the fabric eggs. 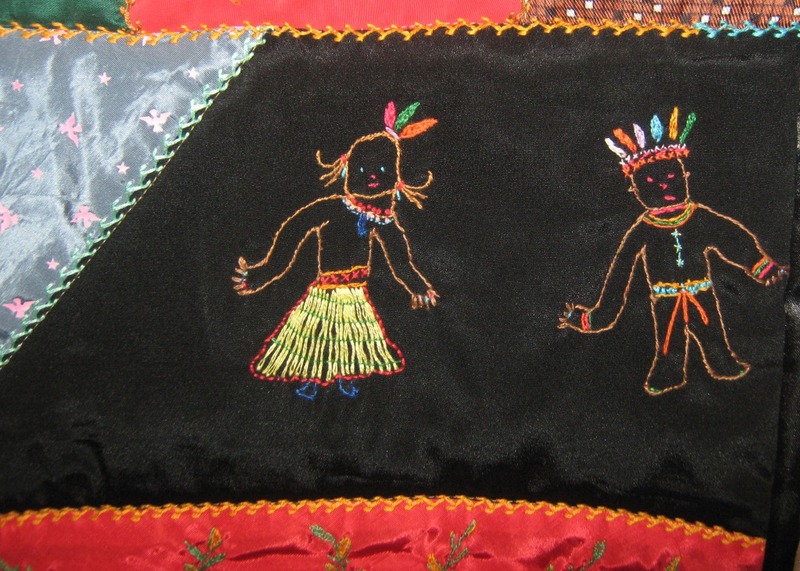 The eggs are stitched by putting right sides together and stitching around the outer edge. Gudrun’s method of cutting a slit in the back fabric piece, and then sealing the cut edge, is definitely the way to go for this small project. 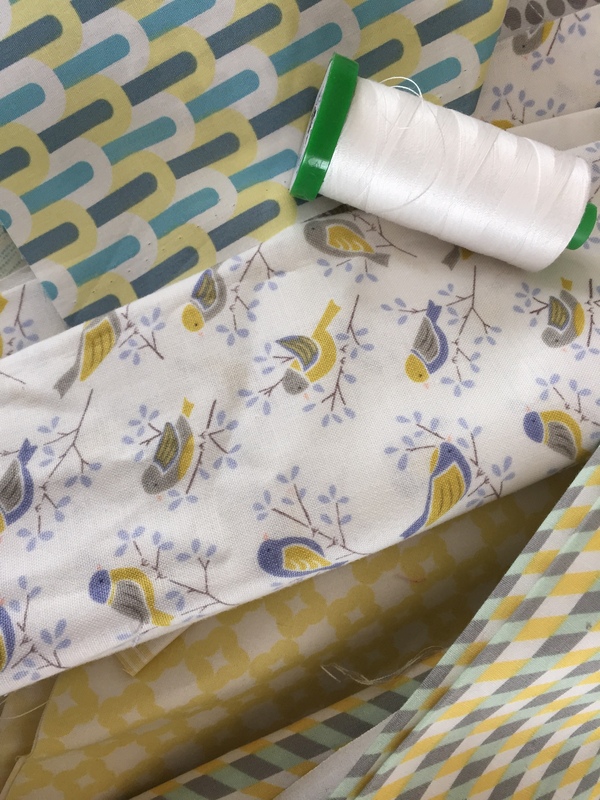 So get the pattern instructions and start making your own fabric eggs, either as ornaments or as pockets to hold a gift. 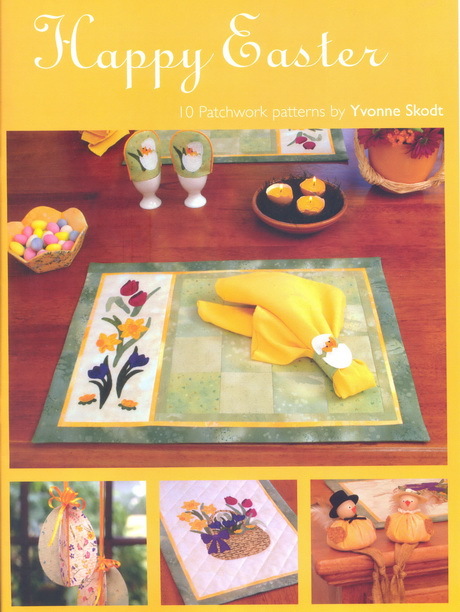 If you enjoy making special projects for Easter decorations you might like to pop over to our online store to purchase one of the last copies of Yvonne Skodt’s “Happy Easter” pattern book. 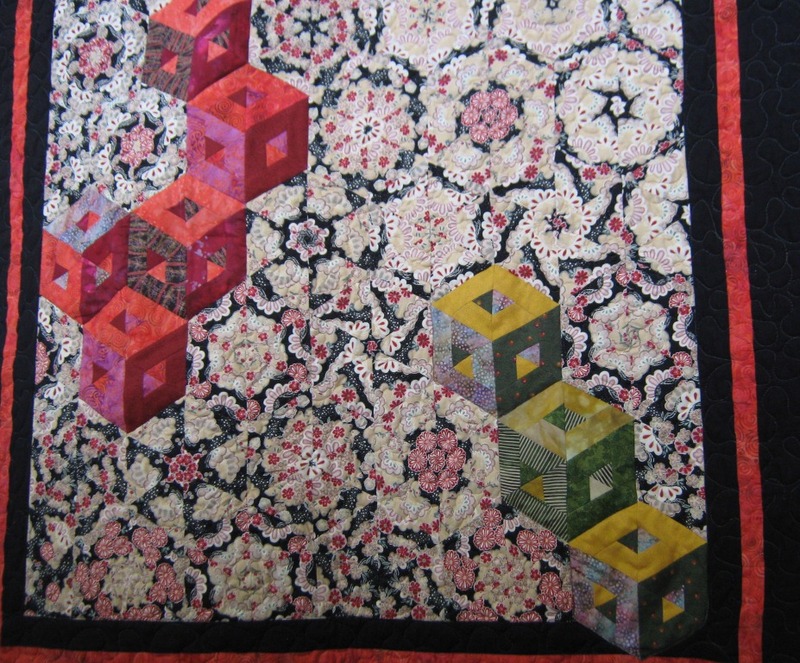 Quilts and tutus on show! 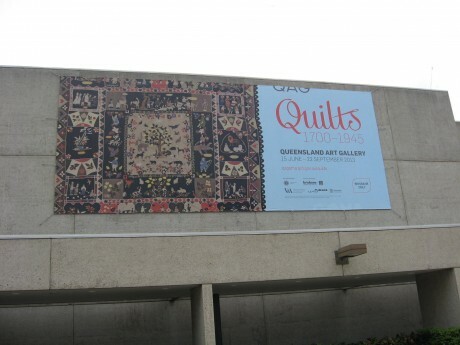 I joined a free guided tour (provided by volunteers) which was a wonderful way to learn lots of interesting details about the quilts’ history and construction as well details of society of the time. Who knew that it was the norm for women to entertain in their bedrooms in the eighteenth century? 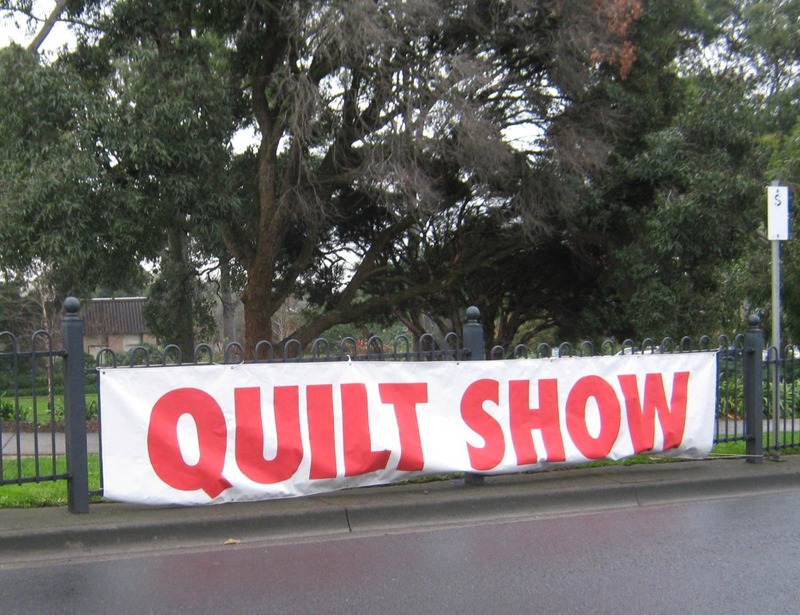 I certainly didn’t, but of course it explains why wealthy women used their bed quilts as a showpiece to display their craftsmanship. Photos cannot be taken in the exhibition (the light would be detrimental to the textiles), so unfortunately I cannot share visually with you some of the wonderful things I saw. 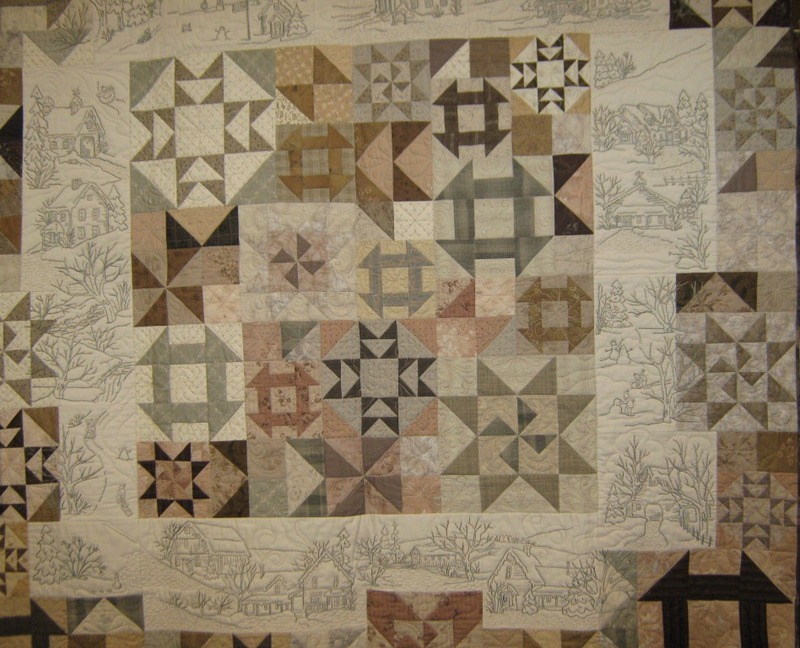 …the quilt made by an officer in the British Army in 1864 who was recovering from TB. Thousands of tiny hexagons made from thick uniform material. …a clamshell bed curtain made for a four poster by orphans in the workhouse. Over 6400 pieces!! 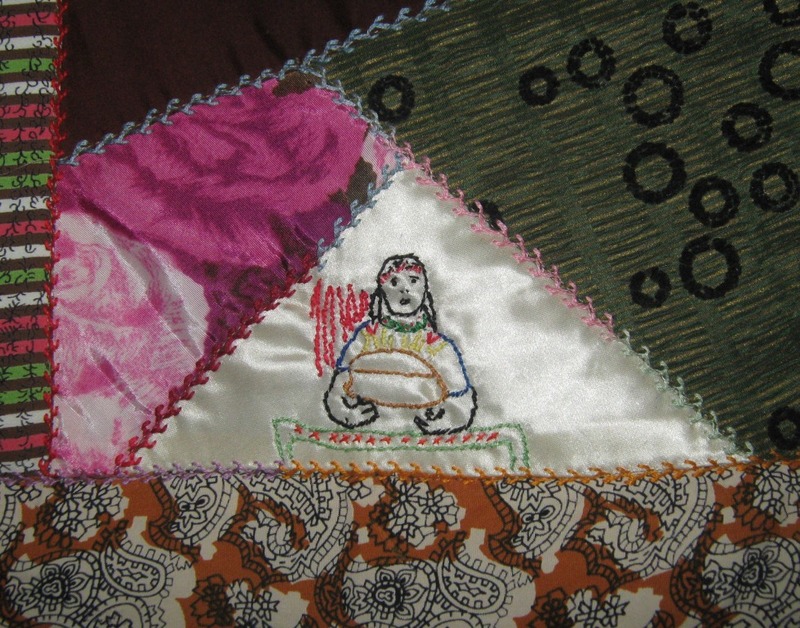 … the incomplete Changi quilt made by young girl guides for their leader, using scraps and threads taken from the seams of clothing. It was worked on for a year before being removed by a guard, and that it survives today seems quite miraculous! One of the things that struck me was the colours and designs of the fabric. The reproduction fabrics so readily available to us today are a true representation of the style fashionable so many years earlier. Clamshells used in a current project. 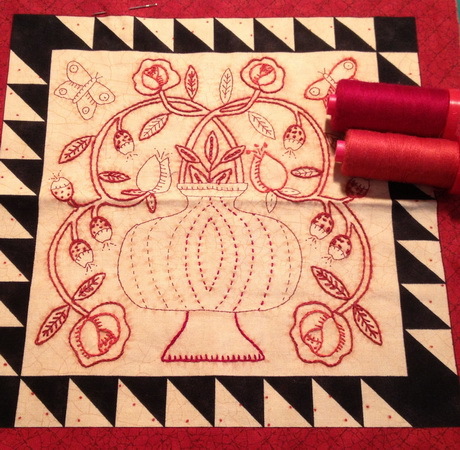 This is one of my current projects, Queen Square by Sue Ambrose. Four of the blocks use Clamshells, but fortunately for me, only 12 Clamshells are used in each block . So only 48 to make, not 6400 as in the bedhanging on display in the exhibition.. Here is the finished block. 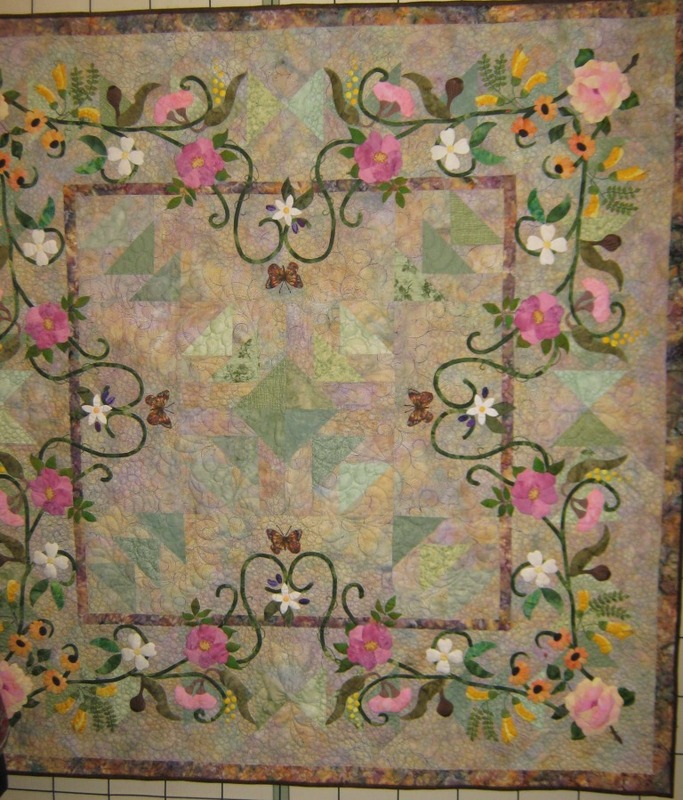 The colours and design would have fitted well with some of the antique quilts on display. 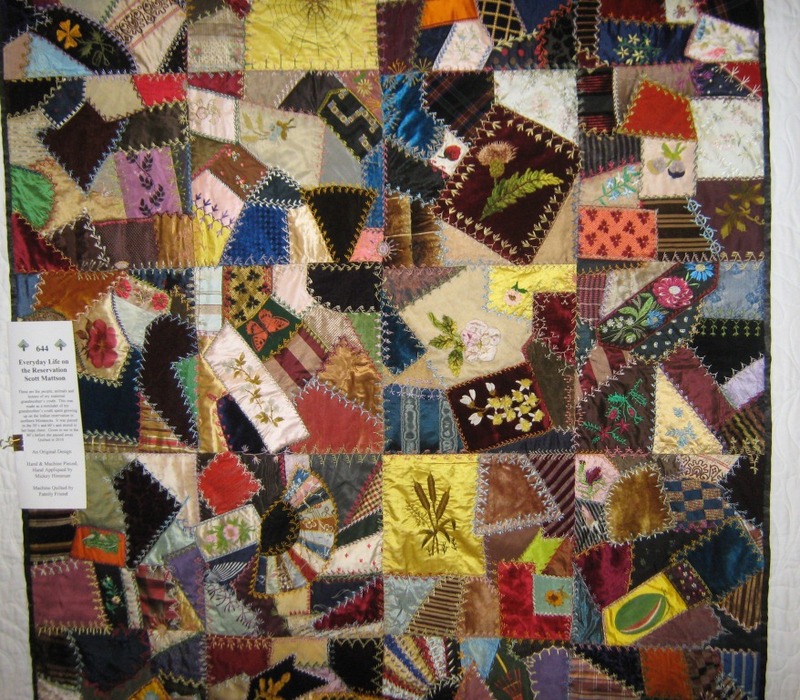 A display of quilts by Ruth Stoneley (1940-2007) entitled “A Stitch in Time” was also on display in a separate exhibition at the gallery. http://www.qagoma.qld.gov.au/exhibitions/current/ruth_stoneley_a_stitch_in_time Ruth was a very inspiring and innovative craftswomen and I shopped at her store when I lived in Brisbane in the 1990s. Some of the items on display reflected the trends of time in which they were made, but some were ahead of their time. “A Women’s Work is Never Done” by Ruth Stoneley. 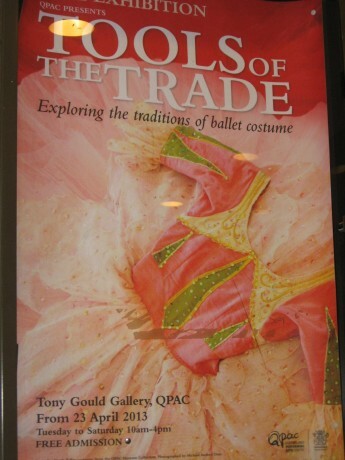 By chance I happened to also come across another interesting exhibition at the Queensland Performing Arts Complex, just over the road from the art gallery. And as if I didn’t have enough stimulation I also took in a regional food festival held at Southbank on the same day. Thanks Brisbane for such an enjoyable day! 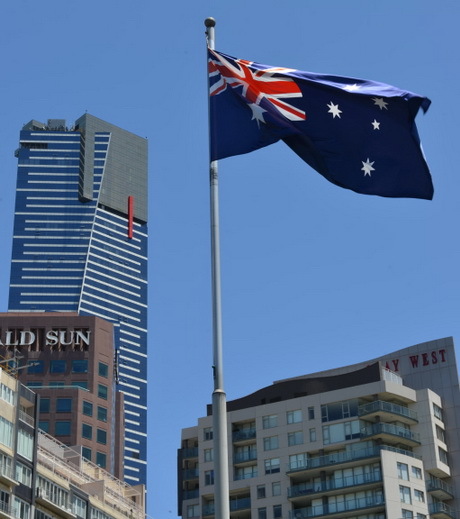 For some reason, the Australia Day weekend always signifies the end of summer, and holidays, for me. I know that we can still expect lots of hot days in February and March, but I still feel as if the “carefree” days of summer are over. There will be no more days playing truant from work to go to the tennis, or cricket, children go back to school and the rest of us start concentrating on the plans for the new year. 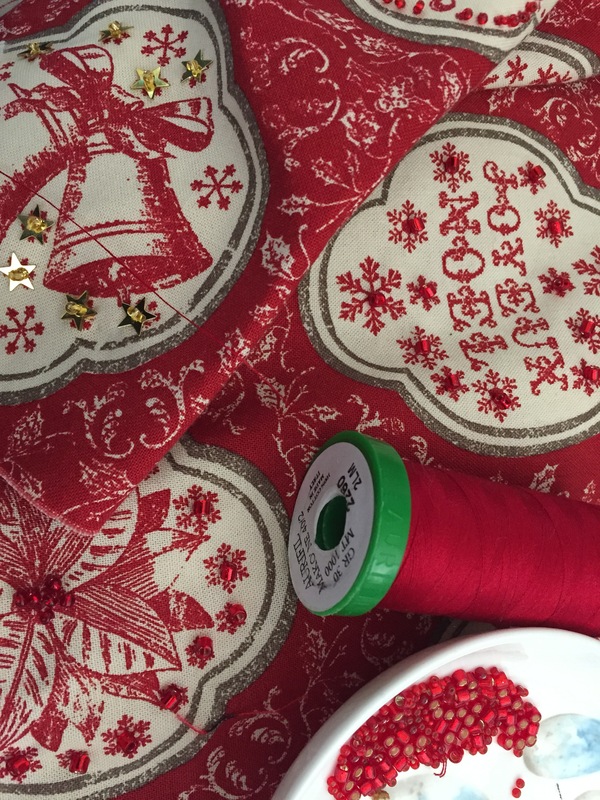 For me, it also means it is time to assess my sewing projects for the year. Some carry over from the previous year, but many are close to being finished. 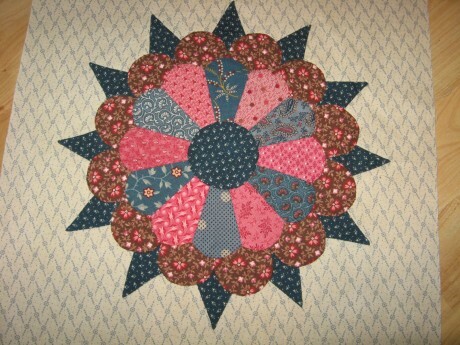 I am still working on the Aurifil 2012 Embroidery block of the month quilt, but it will be finished quite soon. 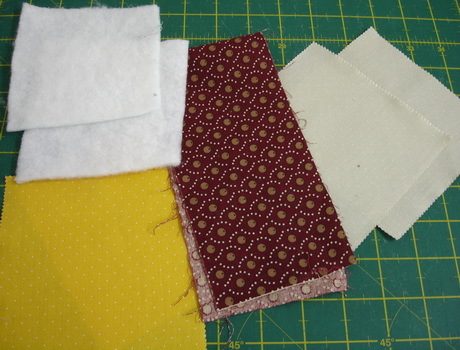 I like to have several hand work “portable projects” prepared, ready to take to friendship “sit & sew” meetings. They are also essential for those wasted hours sitting in waiting rooms when travelling or for sitting through some of the sporting events that I attend by “obligation” rather than choice. 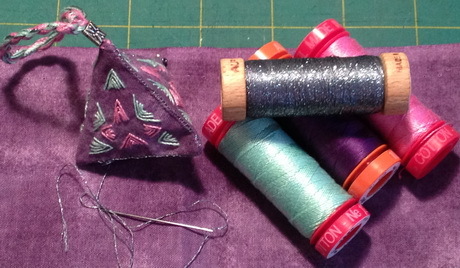 I sort each project into its own bag, with scissors, threads and anything else particular to the project. 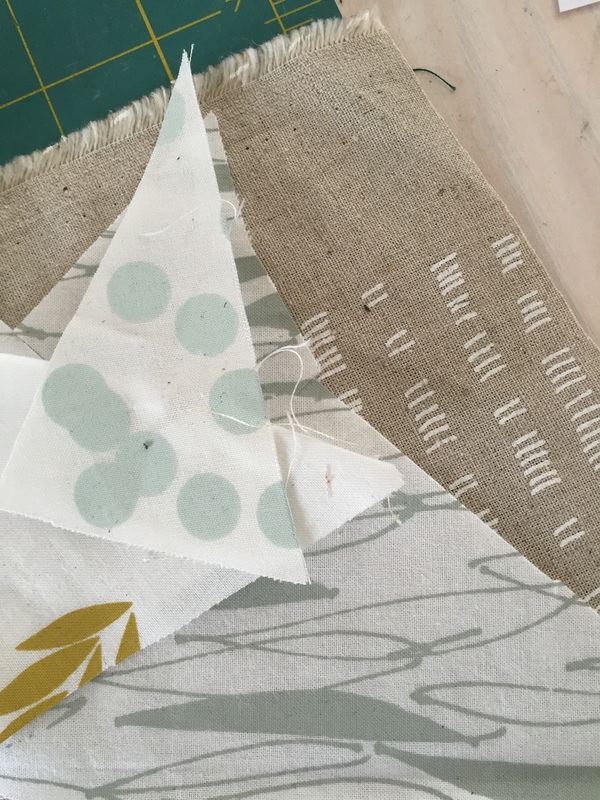 It is a simple matter of picking up a bag as I head out the door, but the hand stitching on most of these projects is close to being finished. 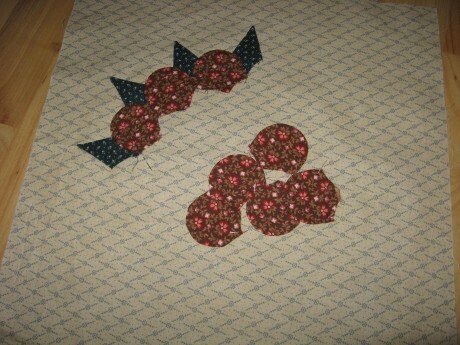 This little scissor keeper is a pattern in the making. So watch this space early in the year if you want to make your own version. I am going to have to set up a new project for 2013. 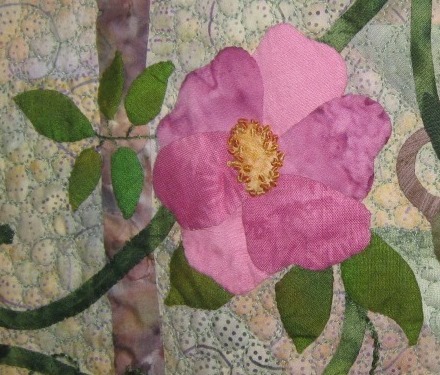 It would appear that 2012 was an embroidery year so maybe it is time I worked on an applique. I’ve been collecting patterns for a while, so where shall I start. 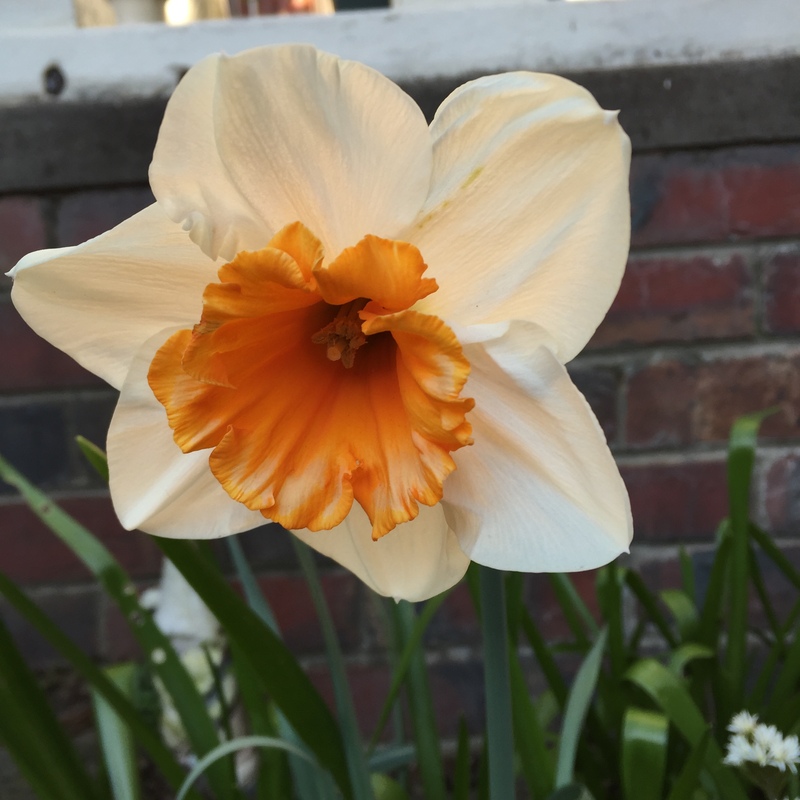 A decision is required ….. let me know what you think. 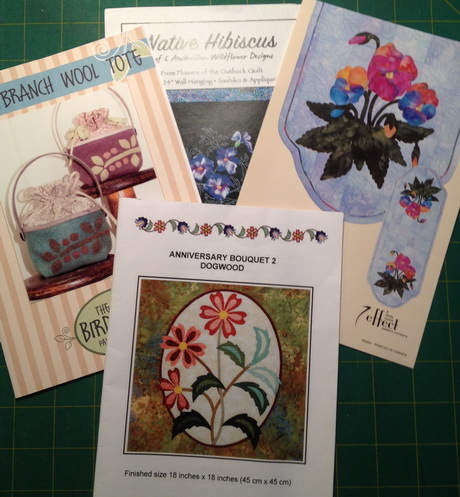 I have a collection of applique patterns waiting their turn to become the project of the year. And a final word about Australia Day. It just wouldn’t be the same without a lamington or two. 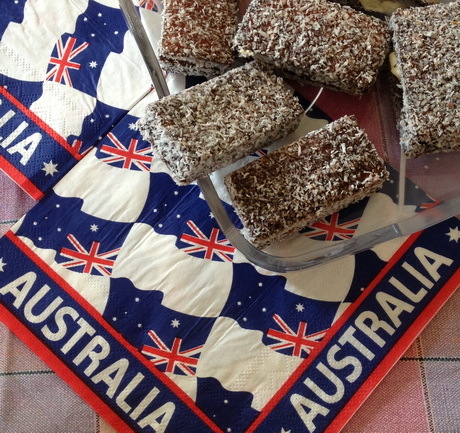 Lamingtons are another Australian icon. Miniature handbag ….an ideal gift. These little bags are filled with lavender and hobbyfill and can be placed with your clothing and linen or used as pin cushions. 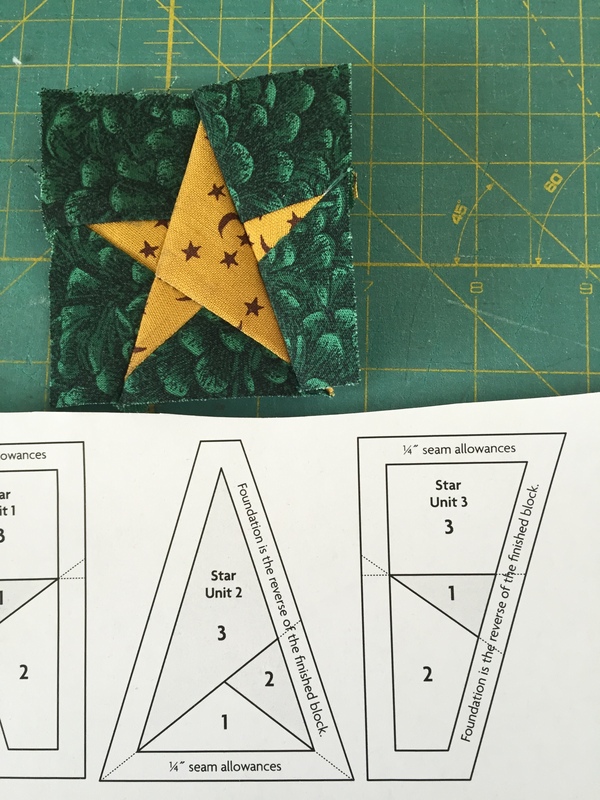 At the time I first saw this pattern, I made a mental note that these would be great gifts for friends and family, and could use fabrics and notions already on hand. 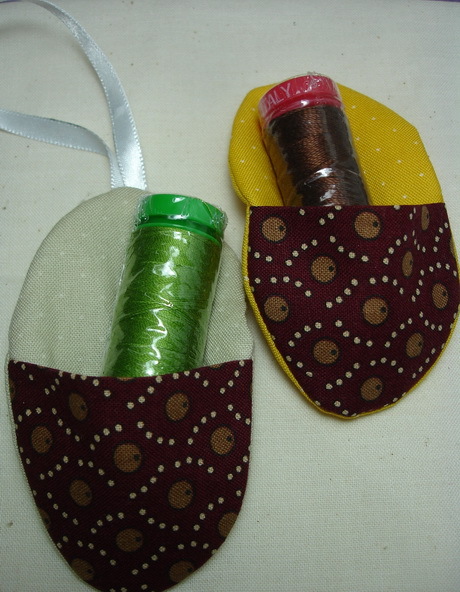 As December approached, I decided I would make some of these little bags as Christmas gifts. First of all, one for each of my colleagues at Always Quilting! 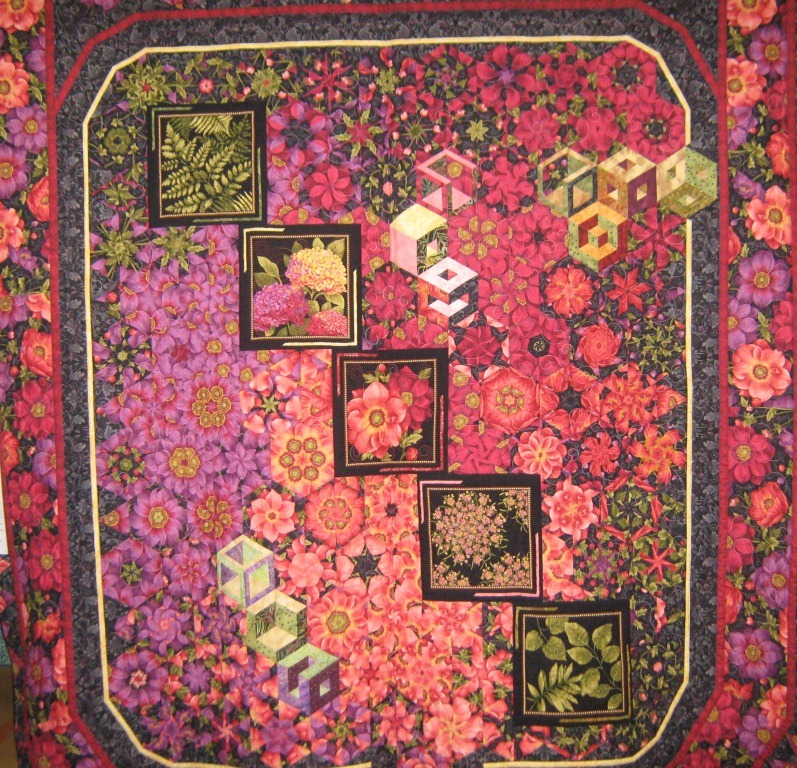 For this batch I did buy fabrics… for these girls I wanted to use items from within the Always Quilting store. www.alwaysquilting.com.au Of course this had to be done with a certain amount of secrecy, but I managed to purchase some fat quarters from the Cuzco range, some matching braid, and Aurifil threads, without arousing suspicion. Bags made with Moda Cuzco fabrics. As you can see from the photos, I added the braid and rick-rack with a contrasting thread, Aurifil Cotton Mako 12 weight, for added interest. To do this, you simply sew over the rick-rack in one direction, then go back in the other. Adding decorative stitching to the rick-rack. You can also decorate the braid with colonial (or French) knots. 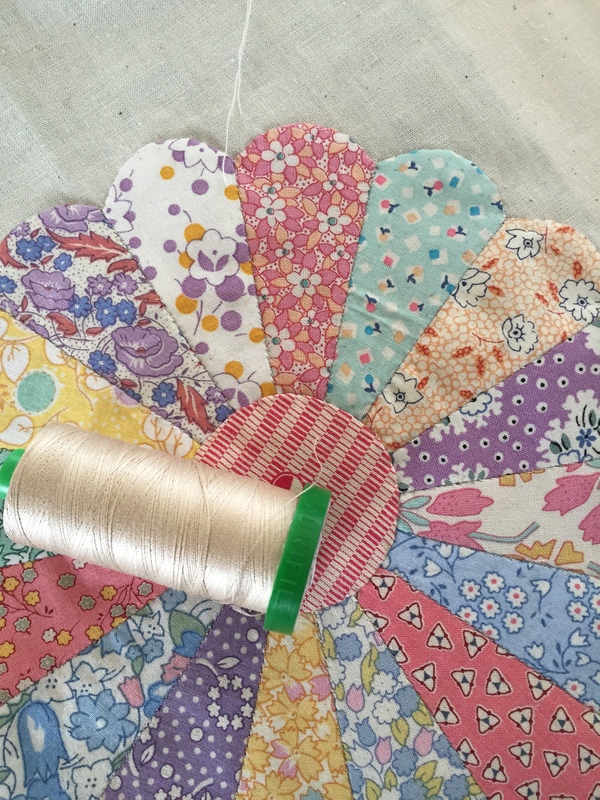 Again Aurifil Ne 12 is ideal. Using Colonial knots to decorate braid. In all I made 15 little bags, 14 as gifts for family and friends, and one for me! !